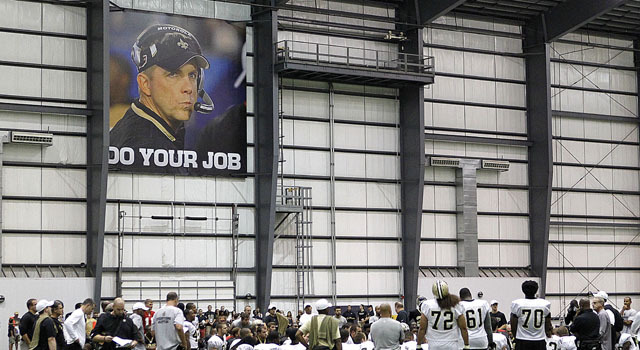 Published: July 27, 2012 at 06:10 p.m.
A banner with suspended New Orleans Saints head coach Sean Payton hangs in the team's practice facility. Suspended New Orleans Saints coach Sean Payton will loom large over everything the team does this year. Literally. The Saints put up a gigantic picture Friday at their indoor facility of Payton scowling with a headset on. The motto "DO YOUR JOB" is written underneath. Unlike the awesome Steve Gleason statue put up Friday, we admit to some mixed feelings on this one. First of all, "Do your job" has been a Patriots motto under Bill Belichick since ... forever. There is also something vaguely disturbing/dictatorial about a suspended coach barking orders from above. It's like interim coach Joe Vitt is a little too worried that everyone will forget about Payton.